A government jointly formed by President Maithripala Sirisena and Opposition Leader Mahinda Rajapaksa would be established in the future, says Sri Lanka Freedom Party (SLFP) General Secretary MP Dayasiri Jayasekara. The parliamentarian stated this addressing a public meeting held in Katugampola, Kurunegala. 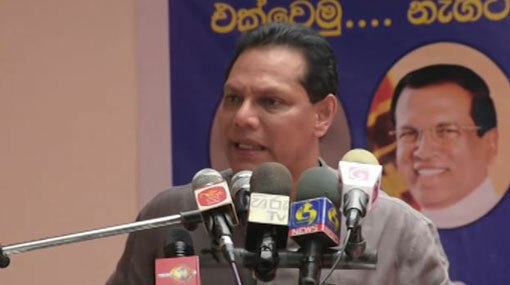 Stating that the GDP growth rate of the country for the past five years had been 3.1 percent, MP Jayasekara questioned if the government can function with the UNP at a situation as such. The President formed a government with Mahinda Rajapaksa, as he was unable to control the large-scale embezzlements, he commented. Addressing the meeting, the parliamentarian said even if certain people accuse the President of ‘changing the tracks’, this decision was taken for the sake of the country. Commenting further he stated that everyone is now functioning together as an alliance and engaged in a left-wing progressive political journey.